Heavy duty transition joint thermocouple, 900 mm (36") long, with 900 mm (36") BX type spiral armor cable. Available in 6, 4.5, 3, 1.5 mm (1/4, 3/16, 1/8 and 1/16") OD, with Inconel 600 or 304 stainless steel sheath (consult sales for 316 SS), and SMPW subminiature connector. 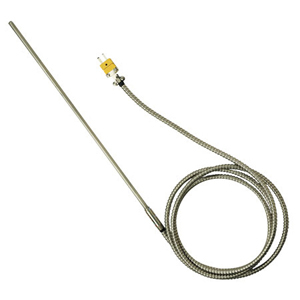 Super OMEGACLAD™ XL sheaths are available for Type K thermocouples with BX armor and standard size connector option (OSTW). Replace "SS" in part number with "XL". Contact Sales for pricing and availability. Heavy duty TJ probe, Type K, Super OMEGACLAD™ XL sheath, 6.0 mm (1/4") OD, with BX armor jacket and standard connector option (OSTW). 참고: Other lengths available, please consult sales. Type K Calibration probes are also available in Super OMEGACLAD™ XL sheaths. Contact Sales for more information.